After last year’s brutal winter which included a late spring, I did not have high hopes for April this year. Easter morning when I dashed over to church at 4am since the ovens weren’t going to turn themselves on, I was not surprised by the wet sleety snowflakes that covered my shoulders and bare head in a matter of seconds. I even searched on ebay for a suitable Easter dress with long sleeves since all the ones in stores are made for sunny spring weather, not Wisconsin in April weather. We had our Easter egg hunt inside too although the sun had mustered the courage to peek out from behind the clouds by the afternoon; it was still too cold for little bare hands to be looking for eggs outside. 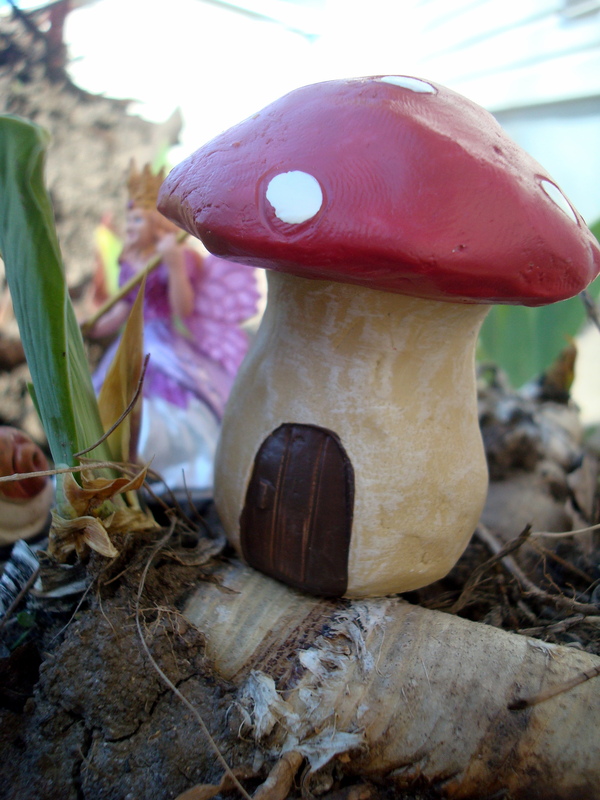 In addition to candy in the plastic eggs, this year a few of the eggs had these colorful fairies tucked inside and the big surprise was the toadstool house complete with miniature birdhouse, snail friend, and arbor. One could assume from this information that I, in my motherly wisdom, looked for an alternative to all the Easter sugar by filling the eggs with other goodies. And sure that was a nice bonus…but really I’ve been waiting rather impatiently for the day when Dellabug would play pretend and build her own fairy houses in the yard while I worked in the garden. Today we had sunshine. Time for the fairies and I to get out into the garden. This strip of dirt along the back of the house has been an incredible tangle of weeds for the past two summers. It’s all the rage with the young blood thirsty mosquitoes too but this year when those pesky bugs stop by to check on their favorite weekend resort they will be met with lavender, rosemary, and oodles of mint. They will get the message that this is now a respectable establishment and it’s time for them to clear off. My husband dug up the top soil to get rid of as much of the horrid stuff as possible. 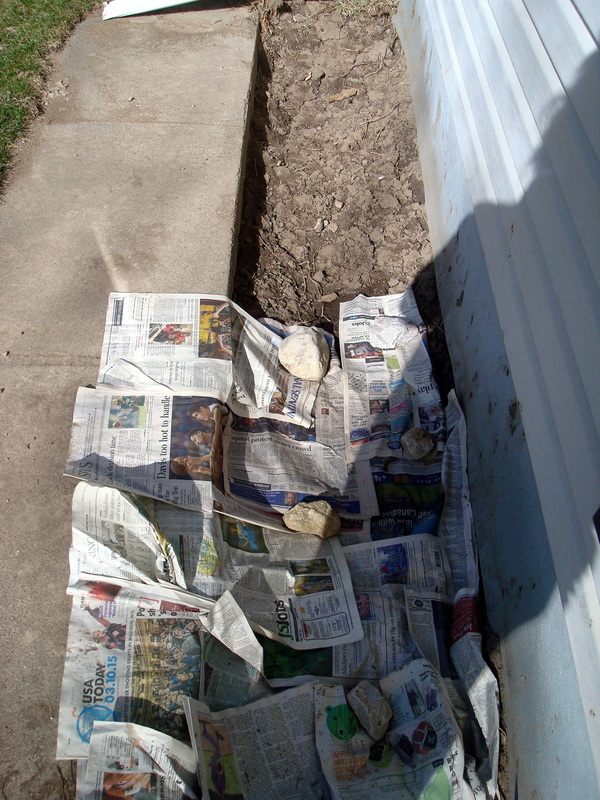 Now I have been putting down thick layers of newspaper and adding a few inches of rabbit manure and peat moss and finishing it off with a weed landscape cloth. Yes, it is still a bit too chilly for sandals. We all pick our battles. My hands were covered in muck so I was unable to capture later moments which included Dellabug taking off her sandals to wade in a tiny puddle, making a swimming pool for the fairies in said muddle puddle, taking them on a hike up a clod of dirt in order to set out a tea party for them with clover leaf plates. So grateful to have sunshine. Finally!